I apologize in advance for the use of stock photos in my review. You know I hate doing that, however I hate using crappy pictures even more, so I made the choice for the people. Because I’m here for you, people. Let’s hug it out. I’m hoping we can still be friends. To make up for it, I’m giving away Subaru stuff. No lie, my friends. I know, my generosity knows no bounds. Anyway, where were we? Right! I was recently invited to attend Subaru’s press event for the new 2012 Impreza. We were treated to an earnest look at where Subaru is at, in terms of market share, and in terms of where they want to be – not so much in market share, but strategically where they want to be, and how they want consumers to consider Subaru. Subaru is in a difficult place – not quite between a rock and a hard place, because things are going very well for the company but hear me out. They have always had the advantage and disadvantage of being considered a niche product. That brings enormous brand loyalty, and I don’t see that going away. However, in terms of selling more cars, it would be important to get consumers to start considering Subaru as a true alternative to other mainstream manufacturers. Why doesn’t the average consumer consider Subaru if they’re considering a Honda or Toyota? Subaru wants us to know that they’re more than just a rugged outdoorsy car equipped with all-wheel drive. They want shoppers to realize that it’s a fun car. That it offers competitive fuel efficiency. That it’s safe. That it’s distinctive, and more refined. It seems that the Impreza isn’t the first car people think of in this class, and Subaru has set out to change that. We were given some in-depth insights into the new Impreza, including some technical goodies. On a personal note, I found this stuff interesting, but it may have caused glazed-over looks from folks who are less car-nerdy. I appreciated that the Subaru team let us in on some of the improvements under the skin, and it showed me that Subaru continues to be driven by engineering, and that they aren’t willing to rest on any laurels they’ve earned. After the presentation, we were given a walk-around of the new model, and then it was off for a morning drive, followed by lunch, and another afternoon drive. 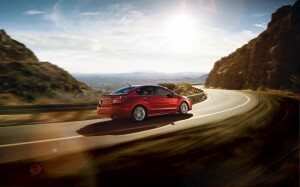 The Impreza is the entry-level Subaru model, and it starts at CDN $19,995. There are four trim levels, and they go up by $1,700, then by another $2,200 and the last one adds another $2,000. You’re looking at around $26,000 for getting into the top-of-the-line, and pricing absolutely tops out at $28,095 for the 5-door Limited trim with the optional transmission. So, let’s have a look at what’s going on under the hood – well, it starts with the familiar (in a good way) Subaru boxer engine. This is a new one, a 2.0 Litre 4-cylinder version of the new FB boxer that recently debuted in the new Forester. Instead of bringing astounding numbers to the table, Subaru focused on a different driving experience. They tuned the engine for torque in low- and mid-speed driving. They reduced friction where possible, made it a DOHC, increased the compression, and did a bunch of other nifty things. They ended up with an engine that feels responsive and torquey, yet delivers a 10% reduction in fuel economy and has better emissions ratings. Not bad, not bad. 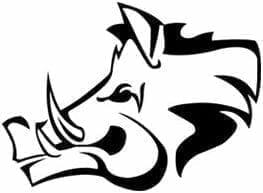 The engine is rated at 148 HP @ 6200 RPM and 145 lb.ft @ 4200 RPM. Fuel economy is very impressive, considering this car is all-wheel drive. Ratings are 7.5 L/100 km (31 mpg) in the city, 5.5 L/100 km (43 mpg) on the highway and a fantastic 6.6 L/100 km (36 mpg) for the combined cycle. I observed 10.8 L/100 km (22 mpg) in a combination of quite aggressive city driving, a couple of very short freeway sprints, and extremely hilly, curvy terrain. In other words, highly inefficient driving conditions led to quite impressive fuel economy, and I feel that you might be able to achieve close to the rated numbers if you drive efficiently. The fuel tank has shrunk to 55 Litres, which still theoretically allows for 1000 kilometer trips on the highway, according to the literature. The power makes its way through a choice of two transmissions – a 5-speed manual with parallel linkage and revised gear ratios, which I sadly did not get a chance to try out, and a new “Lineartronic” CVT (continuously variable transmission). Subaru made a big deal about this new second-generation CVT, indicating that it was significantly lighter, quieter and more fuel efficient. Subaru told us that they had tuned this new CVT to provide a more linear acceleration feel. The transmission offers a “manual” mode, within which you can use steering wheel mounted paddles to control a programmed range on the transmission, trying to give it a feel of a traditional geared transmission. Also, I have to add that they told us that the improved CVT lessened the “motorboating” effect. I almost burst out laughing when they said that. I’m sure everyone stands on one side of the motorboating debate, no? Snarf! Further efficiencies have reduced the weight of this car by 110 pounds. Every bit helps – it makes it handle better, and will help with the mileage. Part of this weight-loss clinic comes from extended use of high-strength steel – in the diagram we were shown, I noted there is a lot of it. 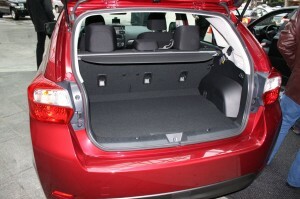 This also helps improve body flexion by 20%, and the Impreza did feel very solid and rigid when I was driving it. The styling of the new Impreza doesn’t make any huge leaps and bounds into any certain direction. It’s very evolutionary, but in a good way. We had the chance to check out both the 4-door sedan and the 5-door hatchback. Subaru lengthened the wheelbase, but kept the same overall length of the car. The new Impreza’s styling is definitely a take on the previous models, but Subaru was kind enough to provide last year’s 5-door model for us to compare it to. You’ll find good but subtle changes in the grille, the headlights (called hawkeye) and at the rear end. Little cues here and there will alert those in the know to the new model’s status, but this is not a crazy restyling exercise that will scream “2012” at everyone who sees it. I quite enjoy Subaru’s chunky styling of the 5-door, and I always have. It appeals to me, in that it’s unique, but not offensive. It allows for efficient use of space inside, and has a sporty appearance, with just a hint of aggression. They’ve done a good job of keeping that and improving on it for the 2012 model. It has smooth flowing lines front to back, and they’ve made some nice angular changes in the grille, and at the back. The 4-door, on the other hand, didn’t do it for me. Mechanically, it’s the same car underneath, of course. But the styling is bland, and although there are changes from last year’s model, I wasn’t smitten with the sedan’s looks. It’s not offensive, by any stretch, but I’ve always enjoyed Subaru’s fearless styling and their willingness to stick to being slightly different than the competition. Place the Impreza sedan amongst its competitors, squint, and you’ll be hard-pressed to pick it out of the bunch. That says boring to me – which fits right into the rest of the class. Just buy the 5-door. This is my opinion on almost every car out there, but boy, do wheels ever make a difference on this car. 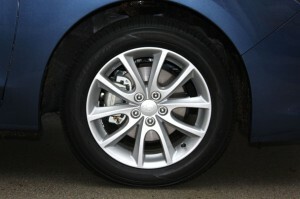 When you see pictures of the high-level trim with the 17″ rims, it’s looks almost like a different car. The smaller rims, while nice in appearance, definitely make the car look more econo-box, and less spicy. 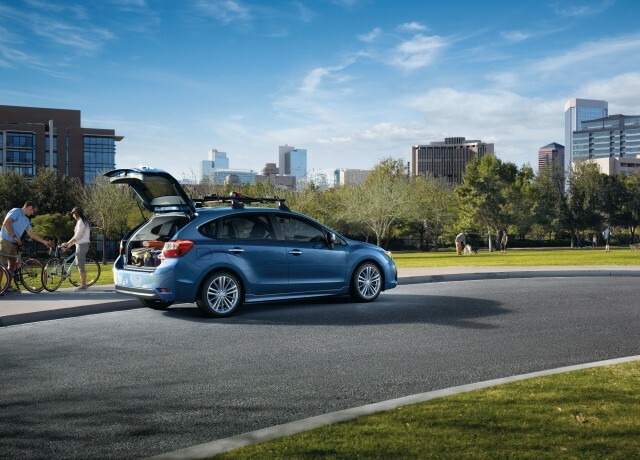 Getting into the Impreza is easy. 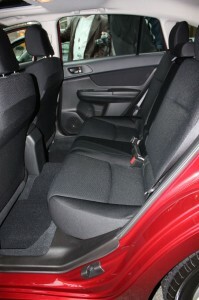 The seats are comfortable and offer decent side and seat pad bolstering. To be honest, I’d prefer more bolstering, but it’s not bad. 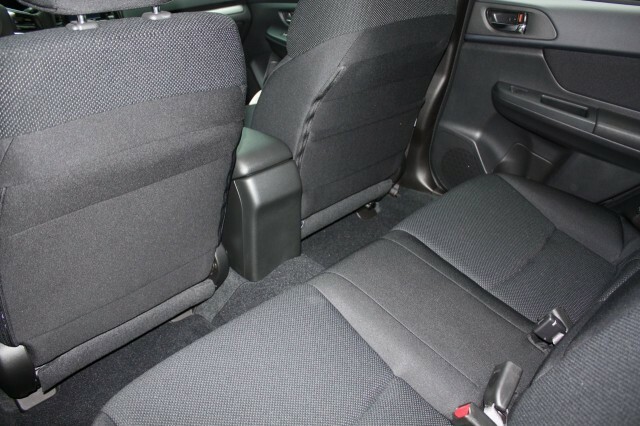 The front seats are manually adjustable and were heated in these trim levels. I really appreciated that the new seat fabrics are much less hokey than the last model’s. 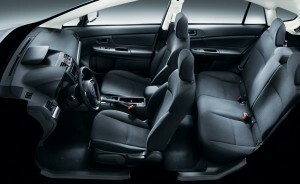 Honestly, the previous Impreza’s fabric choices were terrible unless you headed into leather territory. Grab the excellent steering wheel, and take a peek into a nice, hooded instrument bin, with simple traditional and very readable gauges. Subaru mentioned the improved materials used in the car, and I have to agree – they made a big effort and it paid off. The dash is entirely made of a lovely, rubberized plastic – soft to the touch, and impressively textured for this class. Soft materials continue onto the door panels and the armrest. This is a huge improvement, and makes the interior come across as significantly higher quality than you might expect in this price class. The trunk and fuel door releases are on a small floor-mounted lever. The shift lever is very basic, and there is an e-brake handle on the left of the center console. I found the headroom to be excellent, but it was significantly reduced in the trim with the sunroof. I think it’s still good, but noticeably less. There are little splashes of aluminized plastic trim around the cabin, but it still comes across as quite dark and serious. I found the quality of the switchgear to be excellent, with perfect resistance and tactile feel. In terms of safety, there are plenty of airbags including side impact, side curtain, knee and dual-level front airbags. The stereo system is a basic 6-speaker one, which sounds alright. It feeds off AM, FM, CD, USB and auxiliary sources. Auxiliary and USB plugs are in the lidded armrest bin, along with a 12V plug. You have to step up to the Limited trim for satellite radio, which is dumb. It should at least be an a la carte option. Power windows, power locks and power mirrors are there, and the Sport package had a nice tilting/sliding sunroof. 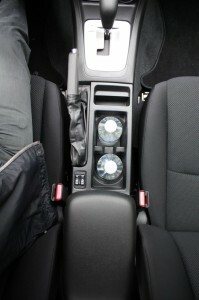 The two higher trims offer automatic climate control. The climate systems use a nice, rotary dial-based control, and they worked well. Exclusive to the Canadian market is a very nice, high-resolution 4.3″ color multi-funtion display that lives in a hooded bin in the middle of the dash. It can display instant and average mileage, an eco history, a vehicle dynamics monitor (with a video-game-like set of graphics showing when you might be losing traction at one corner, etc.) and a clock. I found this display very easy to read. We were also shown that this display is highly customizable, allowing you to add anniversary reminders, tire rotation reminders, etc. Very cool. The high trim level gives you a Pioneer head unit, which is pretty spanky and capable. It should be noted that the lower trim level replaces that display with a monochrome static information display, showing outside temperature, fuel range and the time. Believe me, it’s a disappointment once you’ve seen the multi-function one. One of my readers asked why we are unable to get navigation in the Canadian models. I thought it was a good question especially as it is available in other markets. Subaru advised that their focus groups and this particular demographic didn’t feel that navigation was a big deal and that the consumers didn’t feel a real need for navigation in this car. I’m not sure I agree with that, and said so to them – they did give a little wiggle room, indicating that they would offer the navigation option down the road if enough demand is seen for it. So ask for it, people – it’s available elsewhere, we should have the option in Canada too! I found that getting into the back seats was very easy, and the door opening is large. This will appeal to families with babies and small children. Rear seat room is good, and thankfully Subaru took away the weird swoopy, sculpted knee bolsters that made the rear seat bottom in the old Impreza look like cleavage. It’s a nice, straight seat bottom all the way across. The seats are comfortable, but lack almost any bolstering which will leave your rear passengers …… let’s say mobile, should you pick up the pace and have some fun on the road. Three seatbelts can be found back there, but I’d say you’re looking at a two adult back seat. There isn’t anything else going on back there – no upper air vent, no power outlet, nada. That’s not unusual in this vehicle class though. Oh wait! You do have one map seatback map pocket. For all your map needs, you know? The door bins are small, but reasonable. Headroom was good back there, and legroom was decent – it would get tight for 6 foot tall passengers, but again, that’s normal in this class. It’s a slight improvement over the last model, thanks to the lengthened wheelbase. Visibility out of the back seats is very good. In terms of accommodating kids, you’ll find the standard LATCH anchors back there. The trunk in the 4-door was a nice size (340 Litres), and had a fantastic way of dealing with one of my biggest trunk pet peeves. I hate when you have a trunk full of suitcases or other similarly sized items, and when you try to close it, the trunk hinges come down and you’re stuck with having to rearrange to make it work. 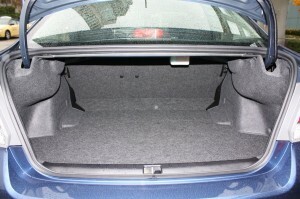 Subaru has nicely upholstered shrouds around the trunk hinges, meaning you always know how much room you have. No surprises. Why doesn’t everyone do that? Mind you, you could just avoid the issue altogether by buying a 5-door. The rear cargo area is a lovely 638 Litres and is easily accessible with a nice load height. The rear seats fold down in a 60/40 split to make the cargo volume 1485 Litres – hey-ooooh! That will allow you to get sizable cargo into this relatively short vehicle. Other than the main cargo holds, you’ll find a reasonable glove compartment, and decent front door bins that could also be cupholders. In the center console, you start with a very nice, deep well in the front, and it includes a 12V plug. Behind the shift lever, you’ll find a multi-level organizer in the center console, and two deep cupholders. Finally, there is a lidded armrest, which covers a very usable bin. We were able to take the new Impreza out for quite a long drive and I had a chance to drive both the 5-door hatchback and the 4-door sedan. I was excited about the prospect of playing in the snow with one of two companies that, in my humble opinion, make a real all-wheel drive system. The other is Audi. Unfortunately, the weather didn’t quite cooperate – we arrived a little late for the snow, but there was some on the ground as we headed into the mountains, and it rained the entire day. Coupled with a leafy mess on the streets, it did make for decent conditions to test an all-wheel drive car. Heading up into the hilly (and practically mountainous at times) West and North Vancouver municipalities, with the endless elevation changes, tight curves and switchbacks, made for a great drive. In terms of traction, the drive was fantastic. I felt the front end slide on occasion, but I was driving aggressively. The understeer was highly predictable and what one would expect. I felt that the tires were the culprits on the occasional slides around corners, and it should be clear that I was driving much quicker around these corners than I would be in normal driving. Also keep in mind that the streets were slushy and/or rain-soaked. I can truthfully say that I wouldn’t have felt confident driving any of the Impreza’s competition at those speeds under those driving conditions. I thought that Subaru did a great job calibrating the Impreza’s new electric steering system. It had good weight to it, and a great balance in chunkiness and road feel. The steering ratio was excellent, and allowed for quick moves and allows this car to be quite communicative and feel natural on the road. I noticed that the Impreza has lost the numb on-center feeling that I felt the previous model suffered from. Of course, another benefit to electric steering systems is that they reduce the load on the engine, and can have a small impact in improving overall fuel economy. 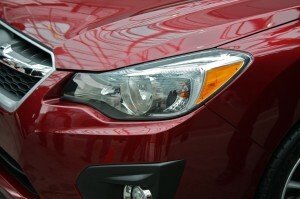 Visibility out of the 2012 Impreza is fantastic from all angles. I was very impressed in this department. The suspension was well done. The ride is firm, but supple enough to be comfortable. I liked the feel of the ride. Subaru has added innovations to keep the vehicle more planted in corners, as well as a beefed-up anti-roll bar. Body roll was minimal, and the car definitely stuck to the pavement when you drove it with some gusto, and remained a decent ride in normal commuting. A good balance, especially for this class. The standard 4-wheel disc brakes were pretty good. I thought they had a decent linear feel, but came across as a tiny bit mushy. Compare the brakes to the rest of the segment though, and they’re very good. Oh, and since we had great opportunity to test them – the Impreza has great windshield wipers! Although 0-60 acceleration with the CVT is rated at a seemingly eternal 9.8 seconds, this car does not feel slow off the line. For typical, everyday driving, most people will be very happy with the power this car provides. I found that getting up and going when you’re already traveling at normal speeds is where this car got a little grumpy. And this brings me to the biggest issue I found with the car. That CVT transmission. I’m not a fan of CVTs as it is. Although Subaru indicated they were going for a more linear feeling, it still has the rubber-band-ish, slingshotty feeling. Although this annoys me, I have to admit that it’s mostly noticeable under heavier acceleration. If you drive this car without a heavy foot, the transmission actually did come across as quite linear, and I liked it. Let me put it this way – if you are a commuter, and you mostly do average driving, you may find the CVT transmission is everything you need. On the other hand, if you do drive with a heavier foot, you will notice the weird traits of the CVT, and I’m not sure manufacturers will ever overcome that. This isn’t a knock against Subaru (because I can say this is the best CVT I’ve driven) – it’s a knock against all CVT transmissions. I do drive aggressively once in a while, and if a manual box wasn’t the right choice for me, I would much prefer a traditional automatic transmission, or better yet a nice dual-clutch box. But neither are available in the Impreza, so it’s either the manual or the CVT. And the CVT is just not cool when you’re doing sporty driving. I gave the “manual” paddles a chance. They’re surprisingly effective, and were convincing some of the time, but in the end, you’re left wanting more – at least out of the transmission. Subaru’s argument is that the CVT is absolutely the best choice for fuel economy with the all-wheel drive. It’s just that the CVT saps a lot of fun out of a great car. Finally, the boxer engine does not disappoint in the music department – it still growls, and makes all the right noises. I like. Honestly, there weren’t many. I saw a couple of opportunities for making this great little car an even better car. I’ve been quite clear about the CVT and that was my biggest gripe. I wish you could get a nice dual-clutch transmission in this car. I am miffed about the lack of navigation in Canada, and wish it weren’t so. I’m not sure if this would ever be a deal breaker, but it really should be optional. I’d love slightly more supportive/bolstered seats, but I also know I can move up into the WRX line to get more sporting equipment all around. The first car I drove had a significant whine coming from the transmission under load. I mean it was loud. It sometimes was at the same noise level as the engine, which I found quite disconcerting, and the gentleman I was driving with noted it too. I should add that the second car I was in had no such issue, and I’m not sure what to attribute that to. Neither did the Subaru folks. Likely an anomaly, but noteworthy. One that really caught my attention was the change in side-view mirror location. 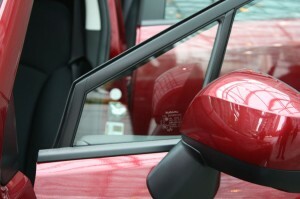 Subaru moved the side-view mirrors from behind the A-pillar to a lower position on the doors. This allowed Subaru to put a small triangular window behind the A-pillar instead, and clears the view for your apexes – very useful, and very effective. 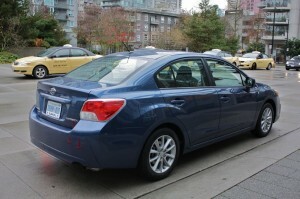 Considering the price, and the competition at this price, I came away very impressed with the 2012 Impreza. I give the 2012 Impreza a grade of 7 out of 10. I’m certain a different transmission option could have made this score an 8. In light of the few nitpicks I noted, you can’t help but consider the starting price, and the selling features, and (I know I keep coming back to this) the competition – the Impreza offers a lot here, and I’m certain Subaru will continue to fine-tune this machine to appeal to an ever greater crowd. You’ve got a car that offers all-wheel drive as standard equipment (with the best all-wheel drive fuel economy available), is built by a Japanese, engineering-driven company, and comes in at a very reasonable price. The 2012 Impreza felt very well built and solid to me. 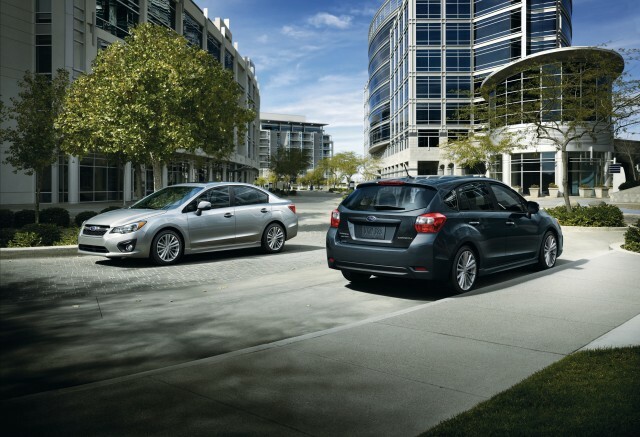 Other things to consider – the Impreza has won the ALG residual value aware for 2009, 2010 and 2011 for the mid-compact segment, and this is the second year that all Subarus are the top safety picks in their categories. 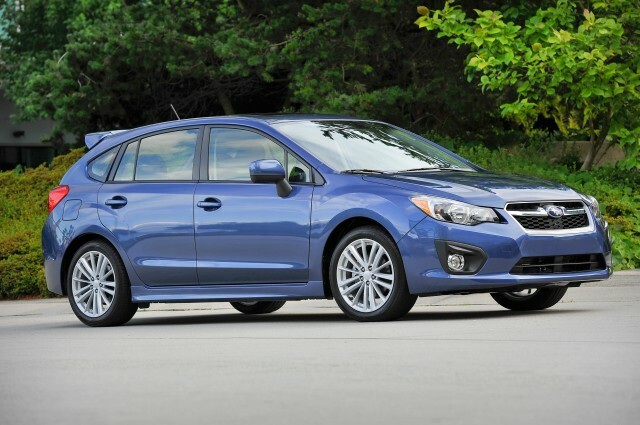 If you’re in the market in this price range, I wouldn’t hesitate to consider the Subaru Impreza. Drive the CVT, and make your own decision – you might find it’s your flavor. I should disclose that I’ve always been a fan of Subaru, and I greatly appreciated the opportunity to talk to their team to get some insights into where they are headed. One quote that continues ringing in my ears came from Joe Felstein, Subaru Canada’s PR manager: “Doing more (volume) doesn’t always mean being better.” I love that about Subaru, and I hope they continue to offer better cars that compete on every level, and I hope that folks shopping for cars in this category recognize them for it. I’ve had some questions from readers about the WRX and the STi. They will continue in their wide-body configurations and will no longer be underpinned by this Impreza. It sounds like Subaru is going to try to differentiate those models a little more clearly from the entry-level Impreza, but we received little information on the sport models. As promised, I’m giving away some goodies – a week after it’s posted, I’ll send Subaru-branded stuff to one random commenter on this blog post and by random I mean my 3 year-old daughter will pick who it is. That’s way more fair than some corrupt accounting firm presiding over the drawing. So comment away, and let us know what you think about the car or if you have any feedback or questions for Subaru. 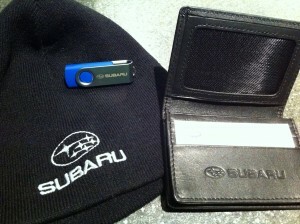 You might end up with a rad toque, a card-holder/wallet and USB drive. Disclosure: I was flown to and from Vancouver and put up for the night by the folks from Subaru Canada. I want to thank them for this opportunity!